Momentoitalia Italian furniture - blog: It's time for a free gift! The clock is ticking and fall is upon us. Then winter will come and all that stress from the Holidays will be old story again. So this year we want to start planning our Holiday gifts list in advance and if you too want to start ahead of time there is a good reason to act now! Check our gifts website at www.moderndesigngifts.com and spend over 2,500$ in gifts, and you will receive a free cuckoo clock! We will ship to you a free "Mondrian" cuckoo clock a retail value of 545$ ! Why the Mondrian? because it's a classic, an elegant clock inspired by the Dutch painter Piet Mondrian. It has history, inspiration, design and beauty, and would make a perfect gift. But if you decide to keep it for yourself we understand ! So what are you waiting for? time flies! Our modern gifts website feature Italian modern cuckoo clocks and wall clocks, Italian home accessories and design pieces. Our collection of design pieces represent a perfect choice for some of your Holiday gifts, for birthdays gifts, for wedding or corporate gifts. So what are you waiting for? take full advantage of this promotion and buy as many gifts as you can! Promotion will end soon! 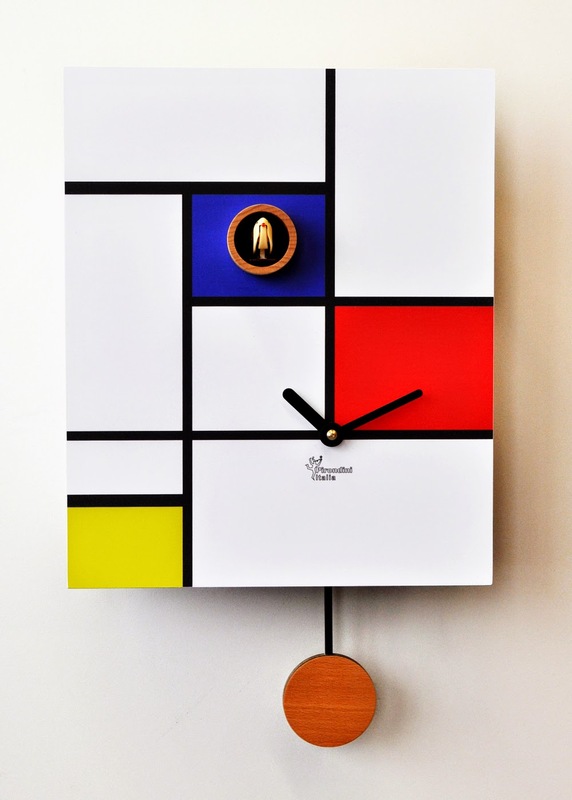 This clock is inspired by the great Dutch painter Mondrian who set up a new evolution of a specific art called neoplasticism consisting of a white background upon which were painted a grid of horizontal and vertical black lines and the three primary colors. If you love art, you want to make an impression or simply you are looking for a nice gift idea this is a fantastic clock. The cuckoo can be set on a high or low volume or turned off. Thanks to a light sensor the cuckoo stays quiet at night. Battery feeding.